UPDATE: Sky and Virgin Media may follow BT in blocking pirate website Newzbin2 | What Hi-Fi? Virgin Media, Sky and TalkTalk have been asked to follow BT in blocking access to pirate website Newzbin2. Earlier this year BT was ordered by the High Court in London to implement the ban, following a case brought by the Motion Picture Association (MPA), which it has now done (see original story below). Sky and Virgin Media have indicated they will obey court orders on the matter. TalkTalk says "it is considering its response". Earlier this month BT came under increasing pressure to block another filesharing website, The Pirate Bay. BT has been ordered by a High Court judge to block access to the Newzbin2 website which provides links to pirated films. In a landmark ruling, this is the first time an ISP (internet service provider) has been ordered to block access to such a site. 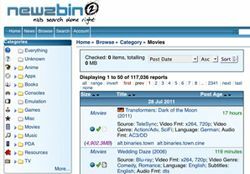 Newzbin2 is a members-only site which aggregates a large amount of illegally copied material found on Usenet discussion forums. BT argued that forcing it to ban its six million UK customers from accessing a website would usher in a new wave of online censorship. In his ruling, Justice Arnold says: "In my judgment it follows that BT has actual knowledge of other persons using its service to infringe copyright: it knows that the users and operators of Newbin2 infringe copyright on a large scale, and in particular infringe the copyrights of the studios in large numbers of their films and television programmes." He continues: "It knows that the users of Newzbin2 include BT subscribers, and it knows those users use its service to receive infringing copies of copyright works made available to them by Newzbin2." BT and the Motion Picture Association (MPA), which brought the case, will be back in court in October to work out how the blocking will work. Similar sites could now be blocked as part of a major crackdown on internet piracy. The British Video Association has welcomed the High Court ruling. BVA director general Lavinia Carey says: " This is a huge step for producers and distributors of video entertainment – but most importantly, it is great for consumers. "Put simply, without the revenue stream from video entertainment, many films and TV programmes wouldn't be made. "Copyright infringement, which costs the video industry more than £300m a year, eats into the return on investment... and that means fewer new projects are given the go-ahead, less high-quality content is created and ultimately viewers lose out."